...building dreams of steel with custom ornamental and architectural metalwork. 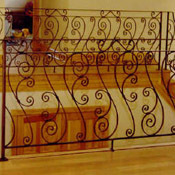 Timeless beauty of custom designed hand-wrought metal enhances any space. Our stylish designs are tailored to work within the style of your home or office. 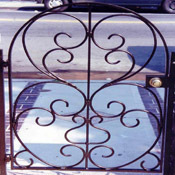 Euro Metalsmiths has been providing quality, hand-crafted, ornamental iron work for more than 40 years. We integrate traditional European craftsmanship with modern day innovation using the most state-of-the-art technology and equipment available in the industry. While most of our work is in the elite Hamptons of Suffolk county, we also provide residential and commercial work in Nassau, Queens, Brooklyn and Manhattan. We take on projects of all sizes, from small private jobs to larger commerical projects. We take great pride in our work. We work hand-in-hand with homeowners, designers, contractors and architects to make their vision come to life. Euro Metalsmiths’ skilled artisans are able to fabricate hand crafted metalwork to your exact specifications for your home or business. In addition to custom Iron work, we can also provide structural steel and miscellaneous welding jobs to your specification. No obligation In-home/business consultations available. Factory showroom appointments also available. 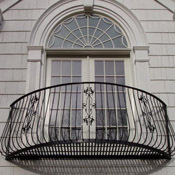 Balcony railings can be matched with entries, gates and other landscape design elements. From traditional to contemporary designs, we have the perfect solution to fit your needs. Wrought iron gates weather beautifully, and will last for years with little maintenance. 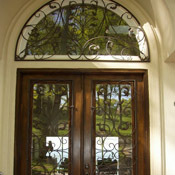 Our highly functional iron doors are built to last a lifetime while offering beauty and security. 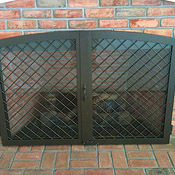 Iron fireplace doors provide safety and are a great design element for any decor. 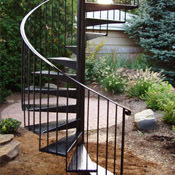 Spiral stairs can be used where a straight set of stairs wouldn't fit and they look great.